The Conquistadors are gearing up for an exciting year in athletics. In a few months, Florida National University will play their first competitive men’s and women’s soccer games. 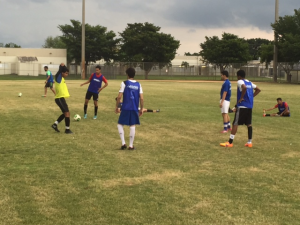 This past week the Conquistadors held a try-out for anyone interested in playing soccer. The turnout was amazing as almost 50 young men and women took part in drills and played in games. Coach Joao was please at the turnout. 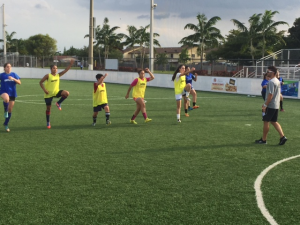 “It was exciting to see so many local kids competing to be a part of the first ever Conquistador soccer team.” The Conquistadors will have their hands full this year as they will play one of the toughest schedules in the state of Florida. Coach Joao is optimistic about the possibility of the programs competing in year one. “We are building our programs with a solid foundation of student athletes who work hard on the field and excel in the classroom. The soccer season kicks off for the men on August 15 against Clearwater Christian College at 7:30 and the women take the field August 17 at 4pm against Florida Memorial University at Goodlet Park in Hialeah, Florida.